Watch Robin Shapiro discuss "Easy Ego State Interventions"
Quick, essential techniques to practice ego state therapy, a popular therapeutic approach. Most of us have different aspects, “parts,” or “ego states” of ourselves—the silly and imaginative five-year-old part, for example, or the depressed, anxious, or angry adolescent—which manifest as particular moods, behaviors, and reactions depending on the demands of our external and internal environments. “Ego state therapy” refers to a powerful, flexible therapy that helps clients integrate and reconcile these distinct aspects of themselves. This book offers a grab bag of ego state interventions—simple, practical techniques for a range of client issues—that any therapist can incorporate in his or her practice. In her characteristic wise, compassionate, and user-friendly writing style, Robin Shapiro explains what ego states are, how to access them in clients, and how to use them for a variety of treatment issues. 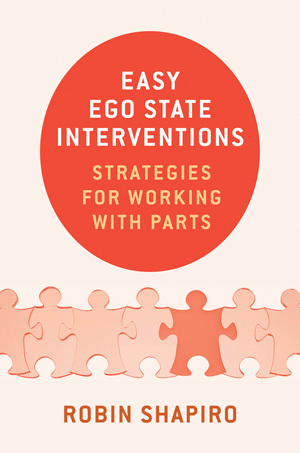 After covering foundational interventions for accessing positive adult states, creating internal caregivers, and working with infant and child states in Part I: Getting Started With Ego State Work, Shapiro walks readers step-by-step through a variety of specific interventions for specific problems, each ready for immediate application with clients. Part II: Problem-Specific Interventions includes chapters devoted to working with trauma, relationship challenges, personality disorders, suicidal ideation, and more. Ego state work blends easily, and often seamlessly, with most other modalities. The powerful techniques and interventions in this book can be used alone or combined with other therapies. They are suitable for garden-variety clients with normal developmental issues like self-care challenges, depression, grief, anxiety, and differentiation from families and peer groups. Many of the interventions included in this book are also effective with clients across the dissociation spectrum—dissociation is a condition particularly well suited to ego state work—including clients who suffer trauma and complex trauma. Rich with case examples, this book is both a pragmatic introduction for clinicians who have never before utilized parts work and a trove of proven interventions for experienced hands to add to their therapeutic toolbox. Welcome to a powerful, flexible resource to help even the most difficult clients build a sense of themselves as adult, loveable, worthwhile, and competent.